programs, provide funds for our scholarship program, and ensure that we maintain our network of member benefits. Dues are paid annually, lasting from July 1 to June 30 of each year. Member benefits are NOT transferrable. Thank you for your support! Please review membership options below. Click here to download a dues information sheet. 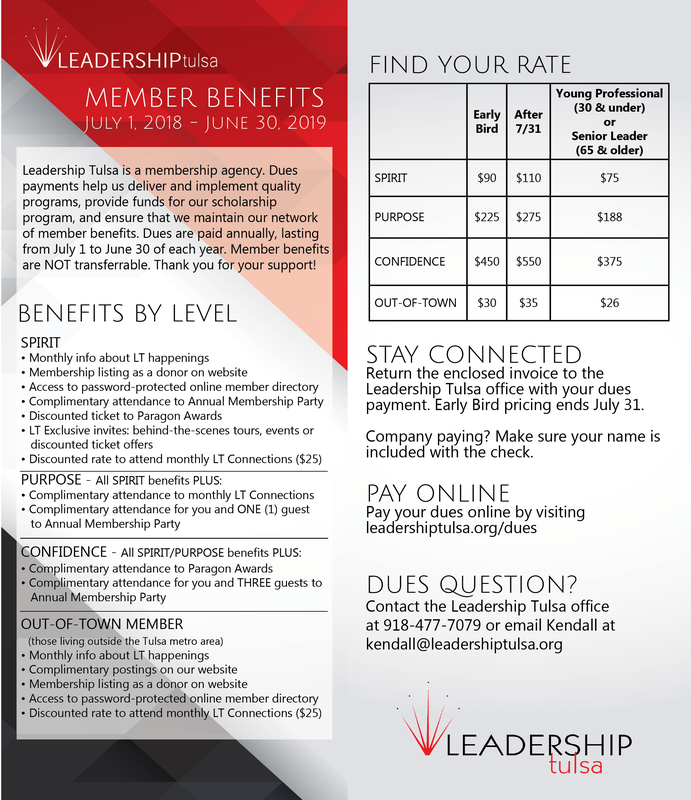 Leadership Tulsa membership is available to anyone who has successfully completed a Leadership Tulsa program past or present, including CAPLC, Flagship, Hispanic Leadership Institute, LEAD North, New Voices, Thrive or the Typros Board Internship Program. *Young Professionals are ages 30 and under. Senior Leaders are ages 65 and older.